Horlicks Gold: Is It As Good As Gold? Horlicks has recently introduced a new product "Horlicks Gold". A person who has a malt drink regularly would agree that all the malt based products are the same. But, is this product different from others and what is so special about it? Let's find out! • It contains natural ingredients and ingredients that provide stamina. .
• Ingredient list: sugar, wheat flour (25%), malted barley (extracted solids) (21%), milk solids(10%), cocoa powder, natural colour (INS 150c), minerals, protein emulsifier (INS 471), natural identical flavouring substances, acidity regulator(INS ), vitamins, salt. • Includes ingredients which help improve brain function, aids in physical growth, for healthy bones and muscles, help maintain electrolyte balance, to help prevent brain cell damage. • Horlicks Gold is available in 2 variants- Golden Malt and Chocolate Delight in Cartons priced @ Rs. 195/- and Jars priced at Rs. 200/-. • The ingredients list doesn't look any different from other malt products. Also, there is a mention of stamina ingredients. Can these ingredients alone give stamina? It's important to consume a balanced diet and follow an exercise regime to improve stamina than just taking a supplement or a health drink. • The aid of such nutrients is important for the ones who cannot or do not eat a regular balanced diet. It could be even more important for people who have disease conditions or general weakness. A person without any problems need not necessarily consume such products. • Looking at the price of the product; why should anyone pay such a heavy premium? Can this be replaced by a product which could cost less? Any other malt based product in the market would have similar ingredients. Even better is a home made malted product made out of several millets like ragi, barley and sprouted grains. This can be more nutritious and their shelf life can also be extended. The challenge for this variant is to convince you to pay a premium for Horlicks Gold. In the store shelf, both Horlicks regular and Horlicks Gold will be displayed and what will prompt you to choose Gold over Regular is the critical question. I don't think that double nutrients or fancy packaging is a strong enough reason for consumers to pay a 30% premium. 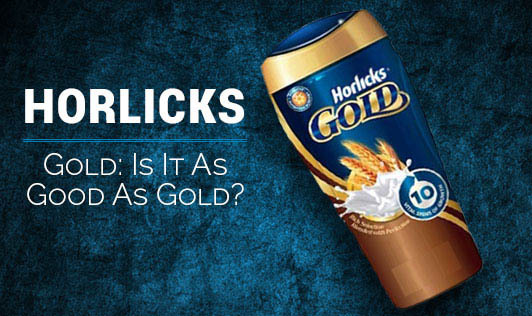 Does that mean Regular Horlicks is inferior product to Horlicks Gold? Is the brand targeting first-time users or expect the regular users to switch to the premium brand? These are important questions that a person needs to think about before buying this product. In this case too, gold seems to be very expensive with similar nutrition as others! So "Be a smart consumer!"